My last day in Baltimore, and I'm in a thoughtful, contemplative mood. I've spent the week representing my company at a trade show. Talking to industry colleagues, customers, and potential customers always gives me plenty to think about. In addition, sluggish economies often force companies into periods of self examination, and this is certainly happening where I work. The morning run takes me along routes established earlier this week, and I spend it reflecting on the past week. In this contemplative mood, it makes sense that my last night in Baltimore is spent in one of the intellectual hubs of the city, the Mount Vernon Cultural District, located just north of downtown. 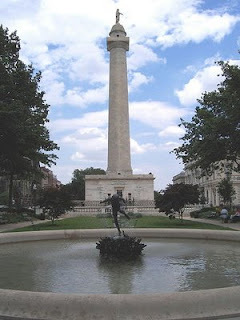 It's home to several theaters, art museums, music and art schools, not to mention the classic looking Washington Monument in the neighborhood center. It is also home of a small brewpub called The Brewers Art, where I'm headed for the evening. After walking up the outside stairs through Roman columns and entering the establishment, there are two choices. Either find a place in the crowded bars in either the first floor or basement for bar food, or go to the back where it's much quieter for various beer inspired dishes at $25-$35 a plate. All by myself, I prefer to be among all the ruckus in the basement bar than the solitude of a quiet restaurant, and eventually find a place down there. The whole place seems to be full of twenty-somethings enjoying each others company over various Brewer's Art beers. It's a re-assuring scene for the future of beer. There's a chalk board behind the basement bar where the various house beers are listed. For a brewpub with seemingly artistic pretensions, many beers have cartoonish names like Sluggo, Ozzy, and Tiny Tim. I get the bartender's attention and start with the Beacon Pale Ale. It's an interesting one. A bit on the strong side, it's reasonably balanced with toasty malt and a good amount of earthy hops. It has a bit of a fruity, yeasty character, almost like there's a Belgian beer struggling to get out of this quintessential British style ale. I also order a sausage platter with a side order of rosemary garlic fries. Polishing the off the Beacon Pale Ale, I next try the Monument Ale, a seasonal Belgian Ale they've recently brewed up. It's pretty smooth for the style, a decent amount of malt, some light fruity notes and a similar earthy hop character found in the Beacon Pale Ale. The sausage platter and rosemary garlic fries arrive. They've created a nice medley of different sausages, from spicy to highly savory, with some tangy sauerkraut and pickles on the side as a good counterpoint. The fries are a little limp, but otherwise, very flavorful. Pssst.....are you starting to get a little bored reading this as I am starting to writing it? I mean, nothing is spectacular here, it's all just very well executed. At some point, all this "goodness" starts to get a bit tedious. Couldn't they serve up a clunker brew here, just to change things up a little bit? I'm also straining to gracefully insert a dated, 70's pop culture reference to "tip toeing through the tulips" into this post, having concluded the evening with a pint of their Tiny Tim Ale. Can I just say this was an interesting, slightly sweet and spicy Belgian Ale and wrap things up? Thanks. On the way back to my hotel, I stopped at a store front liquor store in Mount Vernon. By luck, they happened to have bottles of The Brewer's Art Ozzy Ale, which was sold out back at the brewpub, so I pick up a bottle to take home. Browsing the refrigerators, I saw plenty of local craft brews I hadn't had a chance to sample, and unfortunately, there was no further room in my luggage to take any of them home. I expect to be back in Baltimore someday, and looks like they'll be lots more beer to explore when that time comes.